While the coals are hot, grill a wonderful pizza. Getting the fire ready for burgers or chicken? You can surprise everyone with this delicious “starter”: a grilled pizza. While any ingredients can be grilled, this sweet-and-salty combination of apples, bacon and cheese is always a winner. Preheat the grill to high (10 to 15 minutes, lid closed). When the grill is hot, set the topping ingredients next to the grill. Brush the top of the pizza crusts lightly with olive oil. Place them oil-side-down on grill, and cook until the crusts begin to brown, about 3 minutes. Brush the second side of the crusts lightly with oil, and flip. Sprinkle the grated cheese evenly over the crusts. Top with the apple slices and crumbled bacon. Close the grill lid and cook until the cheese is melted, 3 to 5 minutes. 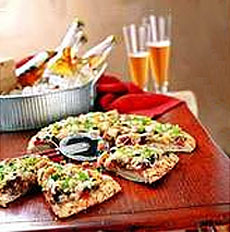 Remove the pizzas from the grill to a cutting board and let rest for about 3 minutes before cutting into wedges. Recipe and photo courtesy of Cabot Cheese. Other material Lifestyle Direct, Inc. All rights reserved. Images are the copyright of their individual owners.